​New Amsterdam was once a 17th-century Dutch colonial settlement that served as the capital of the New Netherlands and was later renamed by the British as New York City in 1644. Almost everyone knows that New York City is one of the oldest and largest metropolitan areas in the United States. What most may not realize is that way back in 1624, the colony of New Netherland was established by the Dutch West India Company and later grew to encompass all of present-day Long Island, Connecticut, and New Jersey. 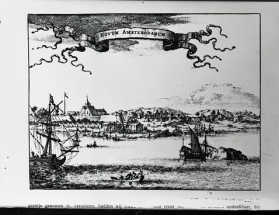 One very successful and growing part of the Dutch new colony was established at the southern tip of Manhattan Island and that settlement was then named as New Amsterdam. In those early days of the colony the Dutch were eager to press for international recognition of the entire New Netherlands area as an extension of Holland itself. In order to make the Dutch claims to the most dynamic part of the new colony located known as New Amsterdam more legitimate, it is said that the Dutch governor at the time, Peter Minuit, officially purchased the island of Manhattan from the local Algonquian Manhattan Indian tribe from which the city derived it name in 1626. At that time, it is said that the Manhattan Indians agreed to trade the entire island in exchange for some glass beads and trinkets that had a value at the time of about $24. Because the Indians were not aware of exactly how European property and contracts worked, the ever-expanding Dutch settlement at New Amsterdam became objectionable to the Manhattan tribe who eventually began warring with the Dutch settlers in ongoing armed conflicts. By the time the year 1641 rolled around, the colonists and the Manhattans were engaged in a prolonged war that resulted in the death of more than 1,000 Indians and settlers. A later Dutch New Amsterdam governor named Peter Stuyvesant, held his position at a time when the British began to challenge the Dutch claims to the island, and although Stuyvesant had hoped to resist the English, he was an unpopular governor and the Dutch citizens refused to follow his command, and Stuyvesant lost New Amsterdam to the British. Following the city’s capture by the British, New Amsterdam's name was subsequently changed to New York in 1644, in honor of the Duke of York, who had helped organized the mission to take the city at the time. Following 1664 when New Amsterdam passed to the English and became New York, there was a period when both the English and Dutch settlers lived together peacefully on the island. In 1673 there was a brief time when the Dutch regained the settlement temporarily, but one year later New York was returned back to the English, and in 1686 New York it became the first city in the British colonies to receive a royal charter from back in England. Events on Manhattan Island and in the city of New York were fairly stable for many years thereafter until the armed conflict known as the American Revolution occurred. Following the American Revolution, New York was the young nation’s largest city and it is a little-known fact today that it actually served as the first capital of the United States from 1785 until 1790. These days, New York City and its iconic Statue of Liberty are familiar to people from every continent, and are now globally recognized as important symbols of the United States and our democratic style of government.